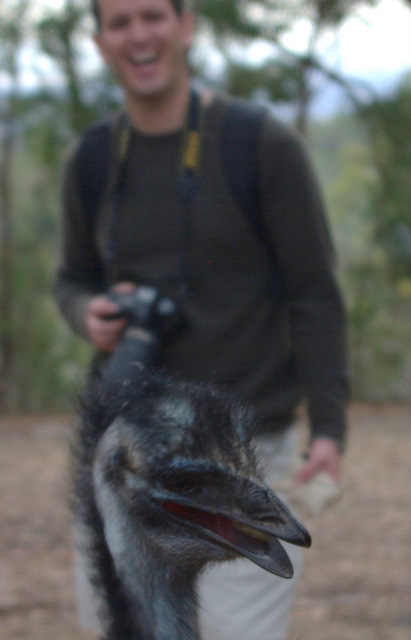 Our friend Abe (and the groom at the wedding) described Emus, noting the odd look that you find on an Emu's face. It must be said that Abe's resemblance to an Emu is almost uncanny. It is good to have friends in far away places. They tend to know the best places to visit for a fun time. 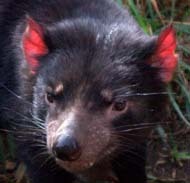 More importantly, they are just good to have around, like all good friends. 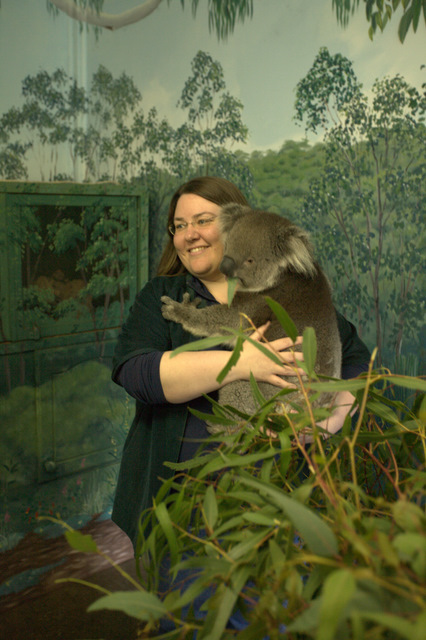 On this occasion, our friends suggested that they knew a great place where you could hold a koala. We suggested that we would be happy to drive, why were we not already leaving, time is wasting away, let's get on the road, c'mon, we have cameras, CF cards, batteries, what are we waiting for, let's move, people. Which is to say, we were enthusiastic. 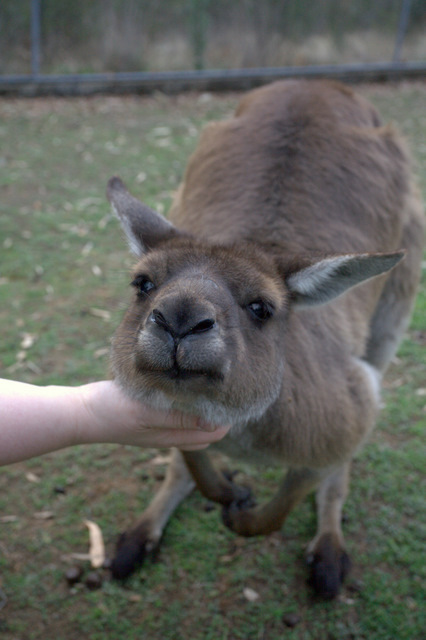 We went to Cleland Wildlife Park, which has all sorts of odd Australian things, as well as animals. 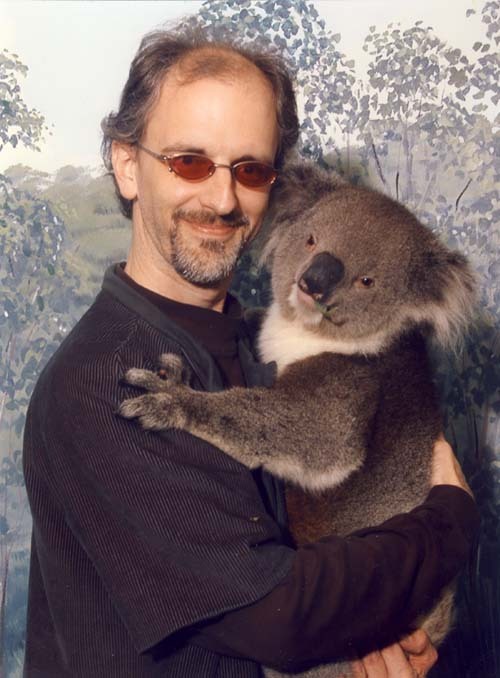 Of course, you all want to see koala pictures. 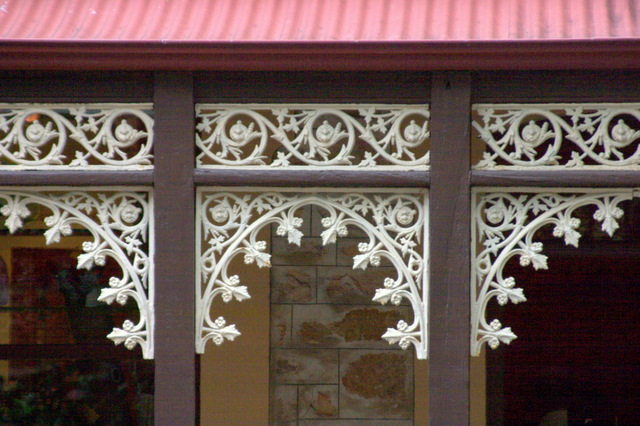 But first, we need to tease you with pictures of Hahndorf. 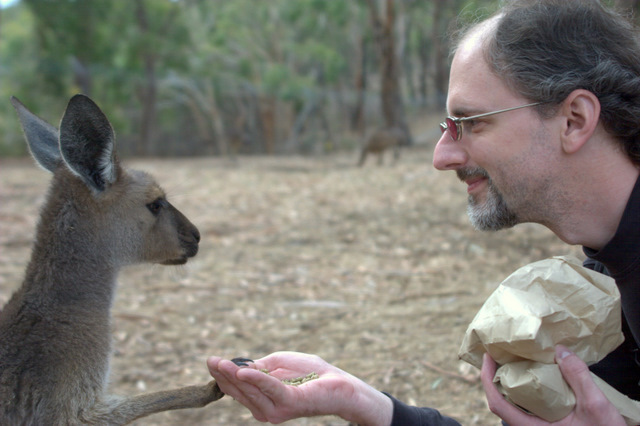 We were really just hanging out with friends in Hahndorf, so we took few pictures. 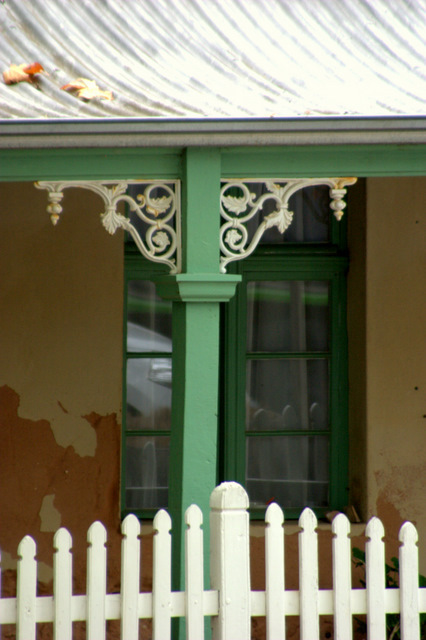 The most interesting would be those showing the brick-a-brack that often graces older houses in South Australia. Almost evokes New Orleans. Finally with a sufficient dose of caffiene in our veins (they make great lattes all over Australia, by the way), we were ready to get to the park. 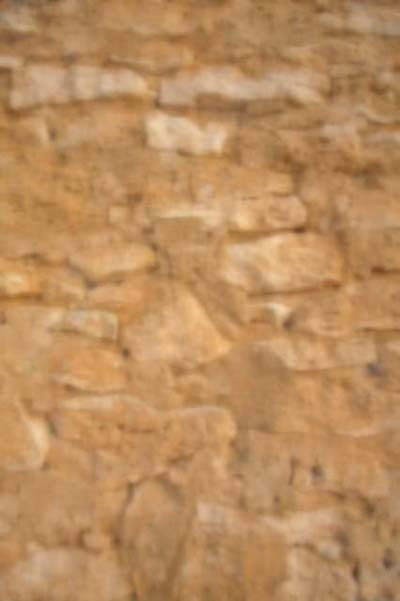 Ok, no more torture, we will start right off with the official pictures. 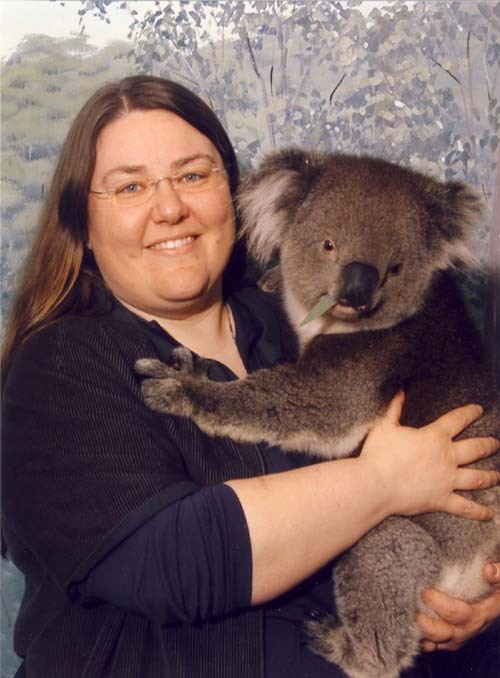 When you sign up to hold a koala, you buy one photograph. Thankfully, the photos are pretty good, except for those people who kept getting in there with the fuzzy and cute Peter Parker. And yes, you can be his friend on Facebook. 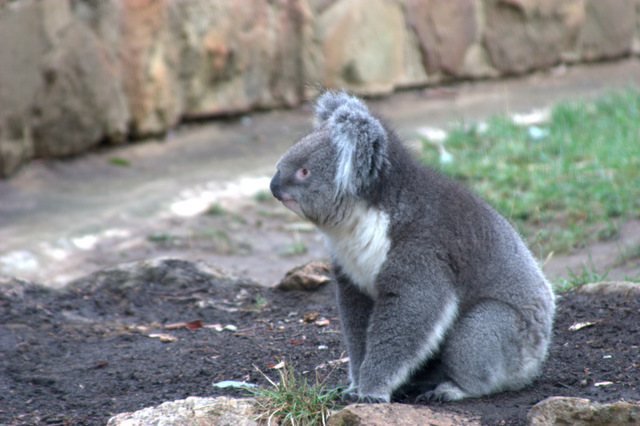 It should be noted that the setting of Cleland Wildlife Park is just as beautiful as the animals you can meet there. Naturally, we spent some time taking pictures of things, both large and small, that caught our eyes. 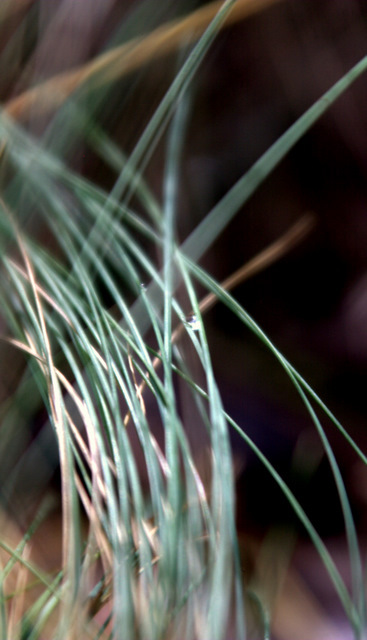 A tiny water droplet sparkling in tall grass. 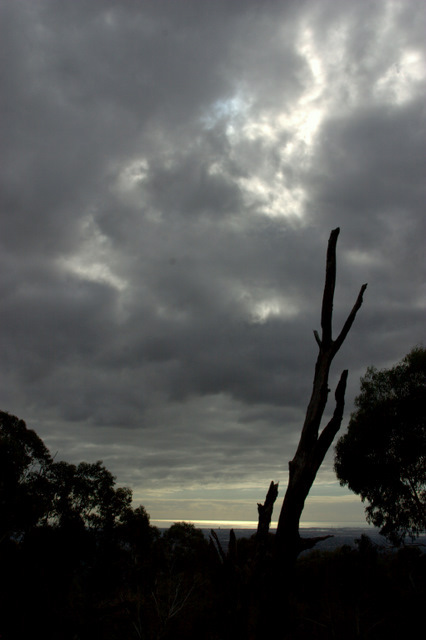 Moody late afternoon sun highlights the gulf west of Adelaide. 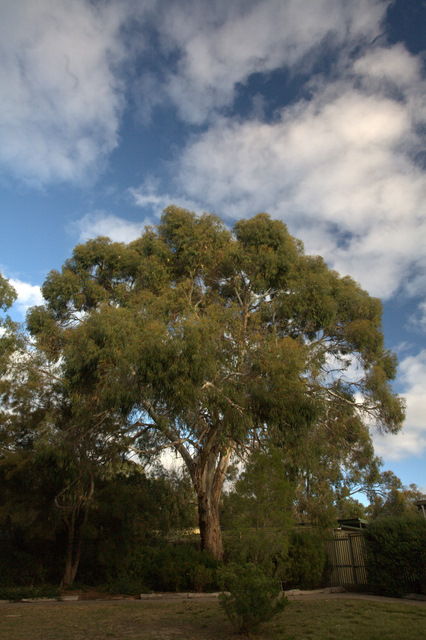 Brilliant early evening light brightens a gum tree at the park entrance. 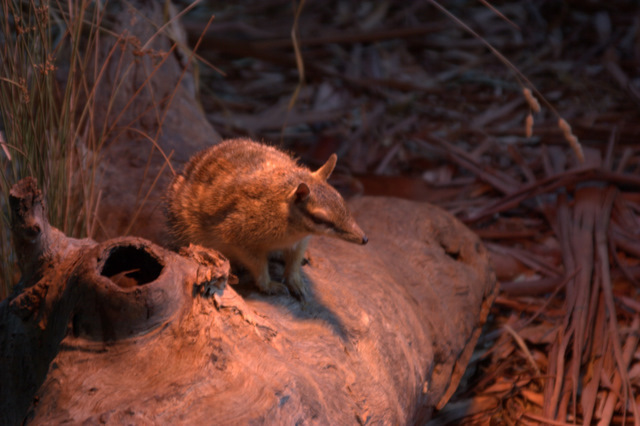 And again, you probably ask, why do i care about tiny water droplets, moody light on some gulf, and/or evening light on a big gum tree when there are kangaroos, koalas, and a host of other cute critters? 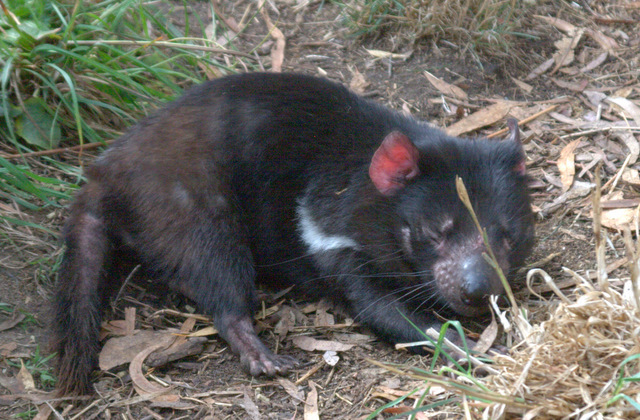 We started with the fearsome Tasmanian Devil. 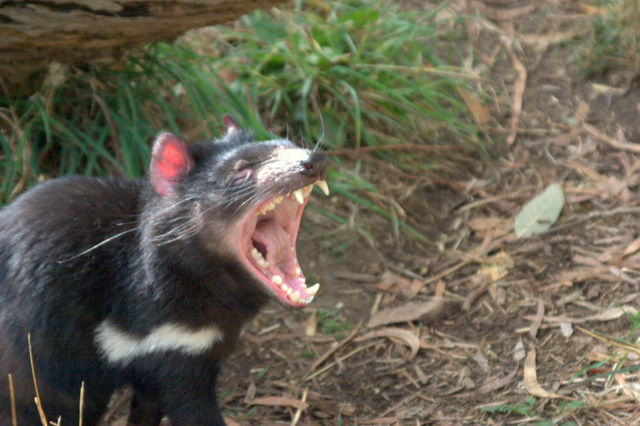 (He was actually yawning, so the roar would be even more virtual.) See the danger in its eyes. This one is looking for rabbit. "Especially rabbits"
When they curl up to sleep, they look a little less dangerous and lot more cuddly. 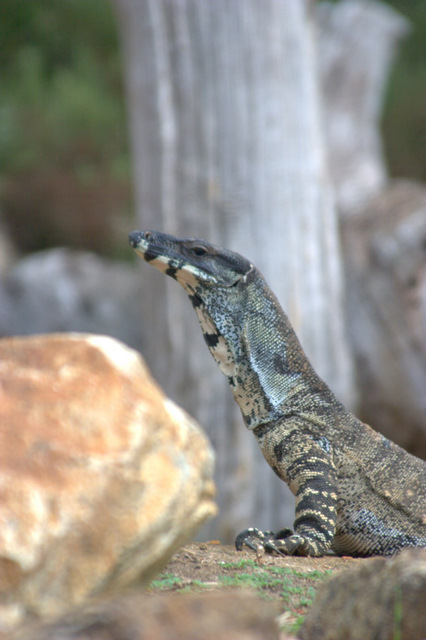 They also have monitor lizards. Cool looking things. It just sat there watching the tourists until it could leave for a smoke break. 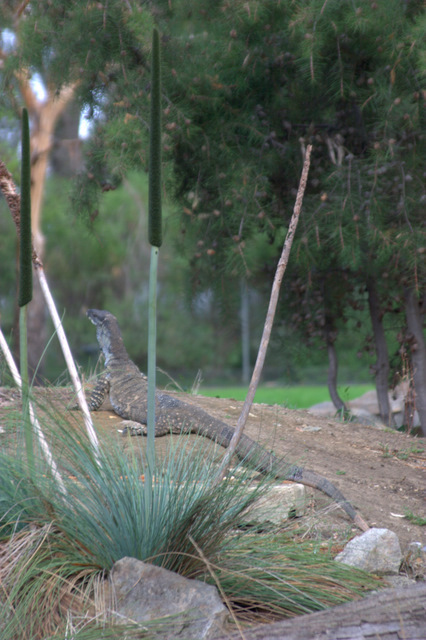 This picture really shows the length of its tail. 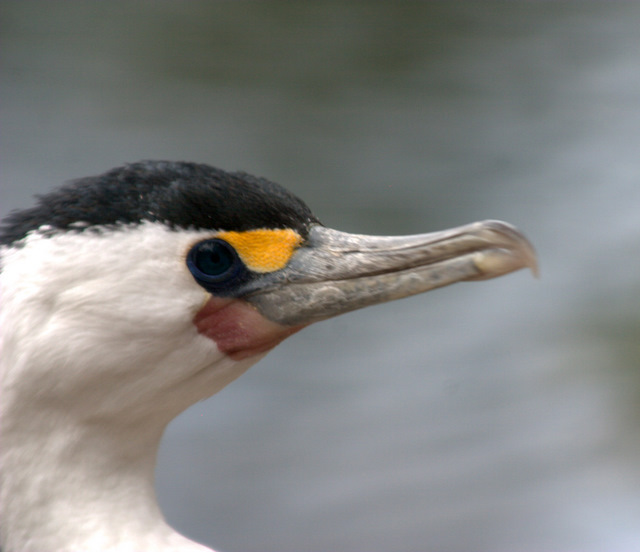 This is a Pied Cormorant. Those distinctive markings definitely seemed worth a picture. Mr. DeMille, I am ready for my close-up. 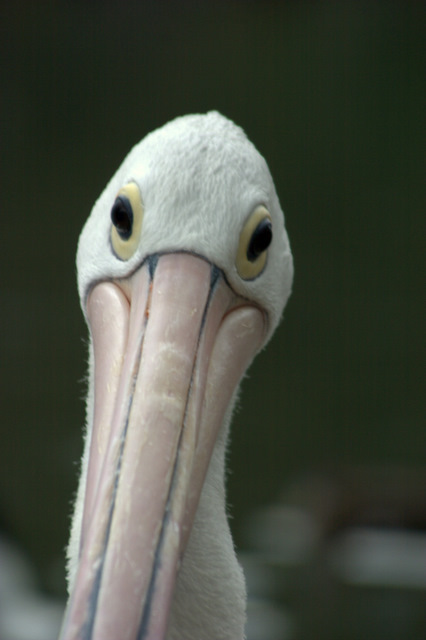 This a view of a pelican that we have not seen a lot of. 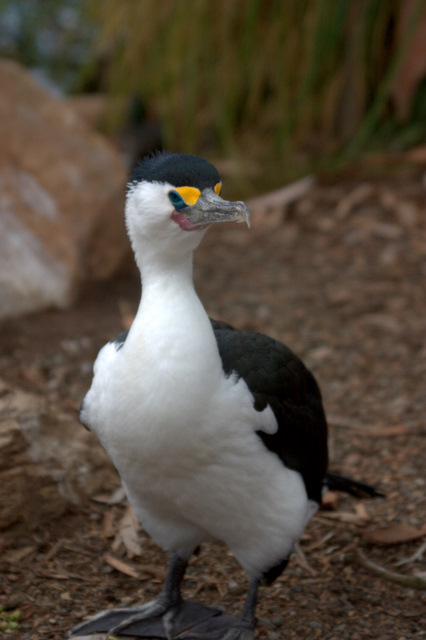 It makes an already-funny-looking bird look even funnier. 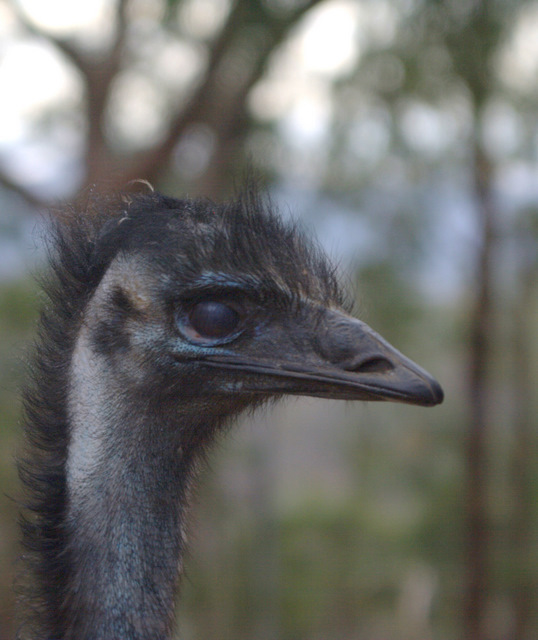 Oops, this is the Emu. 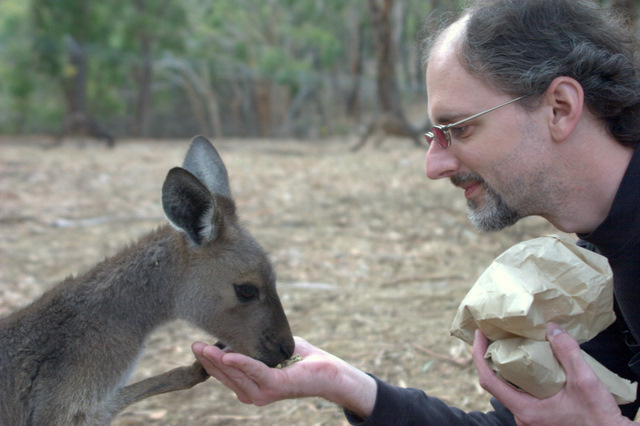 One of the best things about Cleland is that you can actually feed the cute fuzzy animals. And spend time chatting with them about international relations. 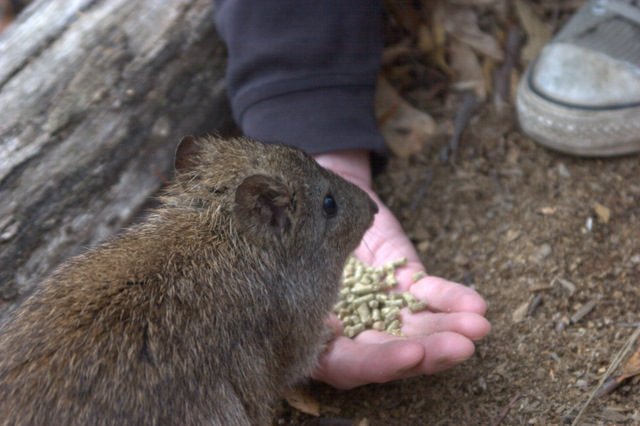 Even the free-range rodents need a little love. 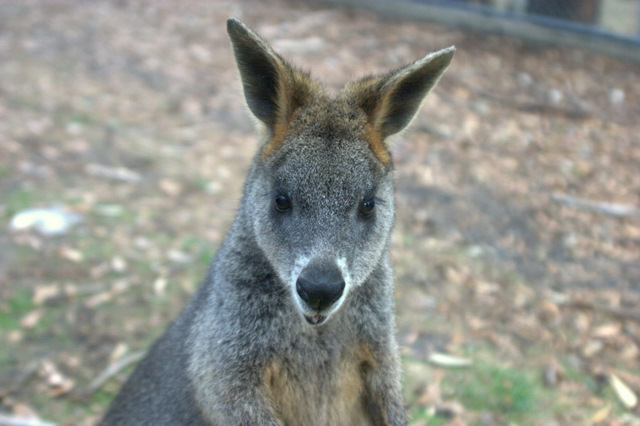 The Wallabies would like to lecture us about appropriate ways of engaging critters. 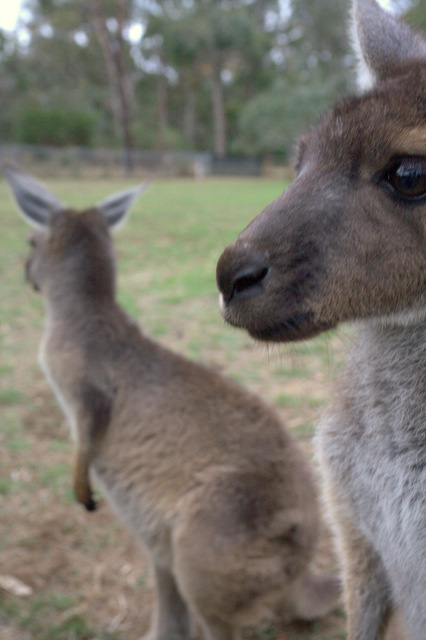 The Kangaroos apparently are watching for the feds to show and and shoo away their dealer. 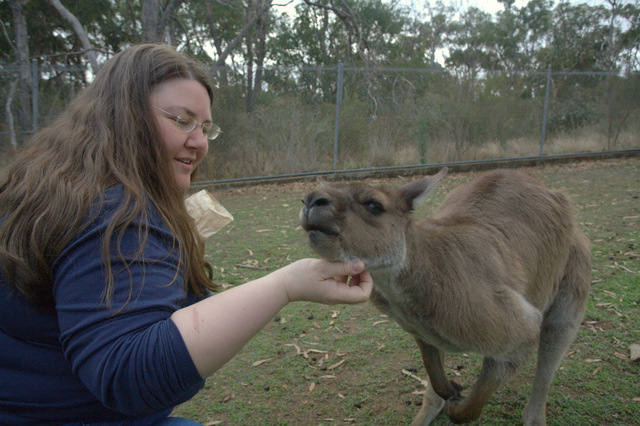 Despite the concerns of the Wallabies, Lea Ann has found the way to this Kangaroo's heart. Look at that expression of "disgust". The Wombats bite, according to the sign. 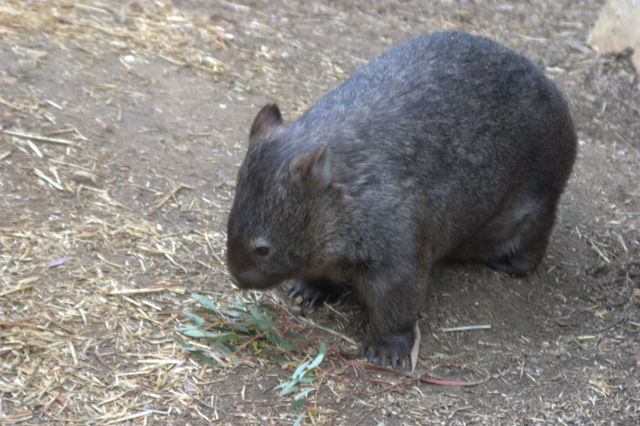 No feeding the Wombats. 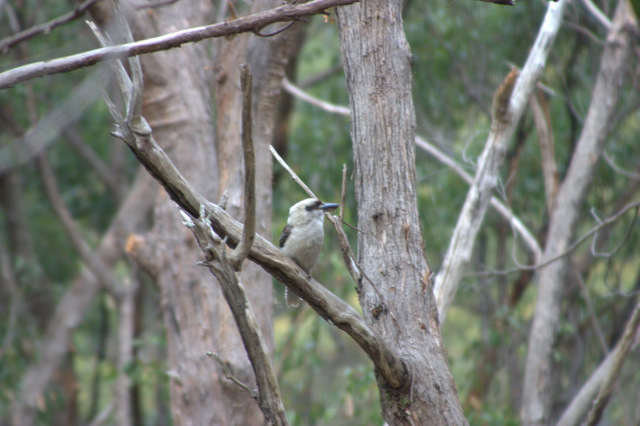 This is an actual sighting of a free Kookaburra! Oh yeah, they have Koalas. Did we mention that? 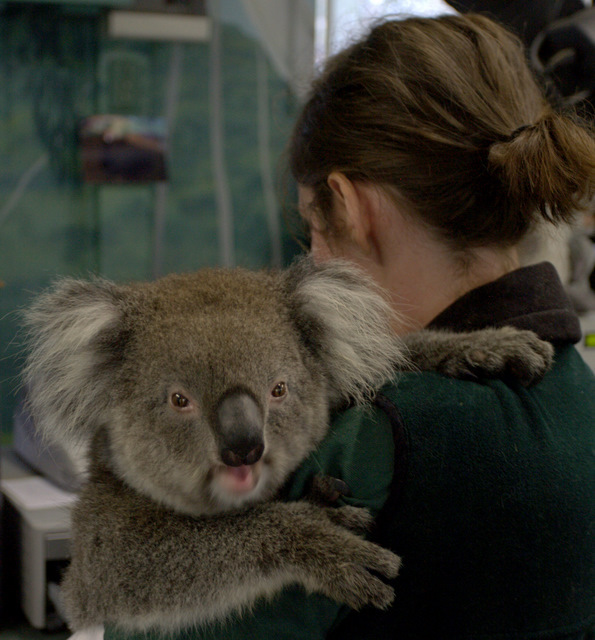 Here is the young lady Koala whose shift was ending right before Peter Parker came on. 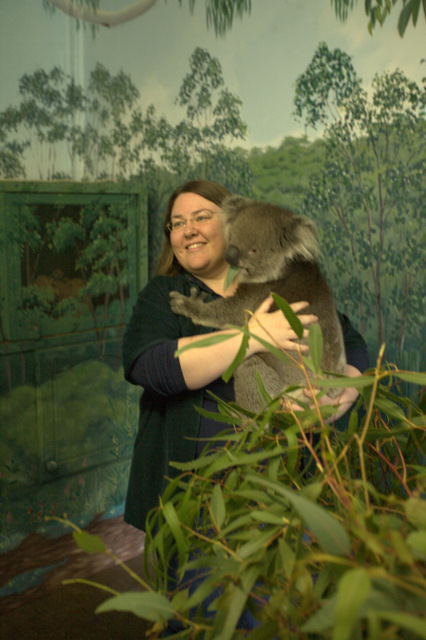 Here she is saying "So long suckers; it's eucalyptus time!" 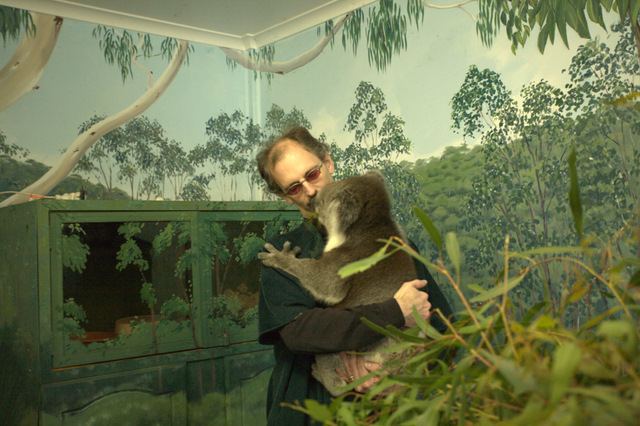 The Koala wrangler (Koala drover?) has several simultaneous jobs. 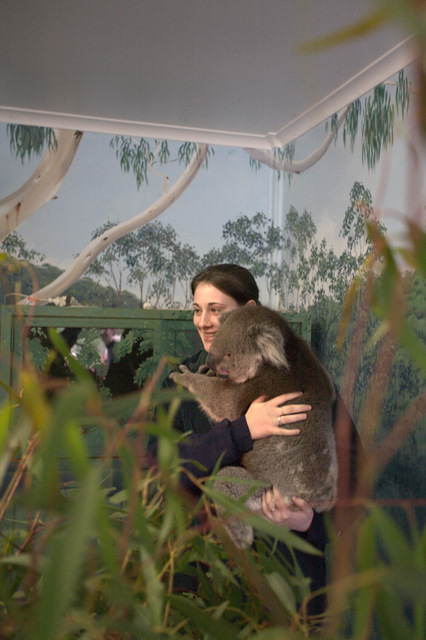 She keeps the Koala happy, gets the guest briefed and ready (including giving each guest a tough jacket to wear over their clothes, so that the Koala has something firm to grasp), takes your money, takes the picture, etc. Seems like quite a lot to do while shuffling an animal on and off some pretty skittish people. Fortunately, she encourages other guests to also take pictures during this process. Naturally, we did not hesitate. Unfortunately, it was a bit dark in there, but we managed some fun pictures of our group members with Peter Parker. Here Peter Parker is doing his best Groucho Marx impression with the eucalyptus leaf. 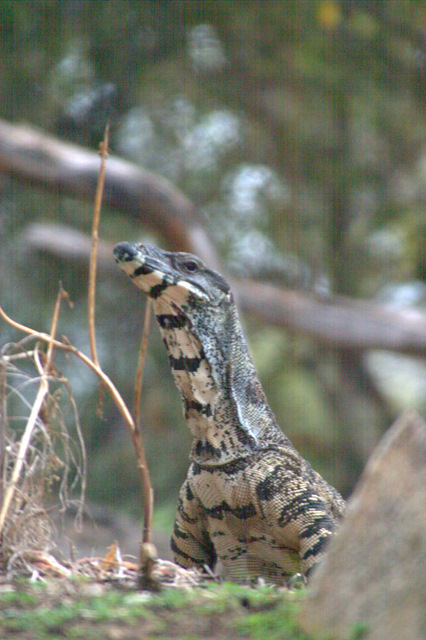 In this one, it is more just sticking his leaf out at the camera. Very cute. 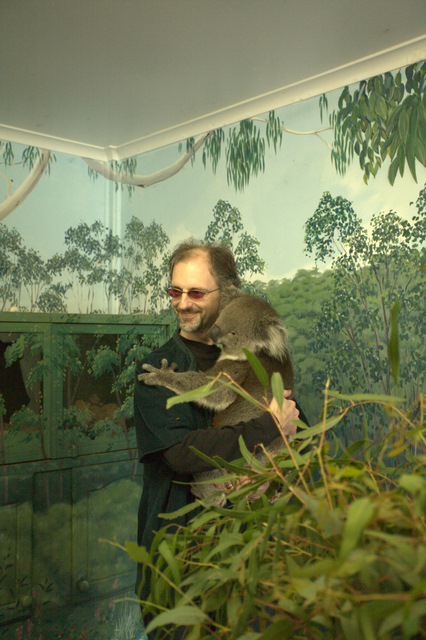 Check out the two opposable thumbs on a Koala's hand, which are nice and clear on Stuart's right shoulder. Peter was probably not happy with people breath, either. 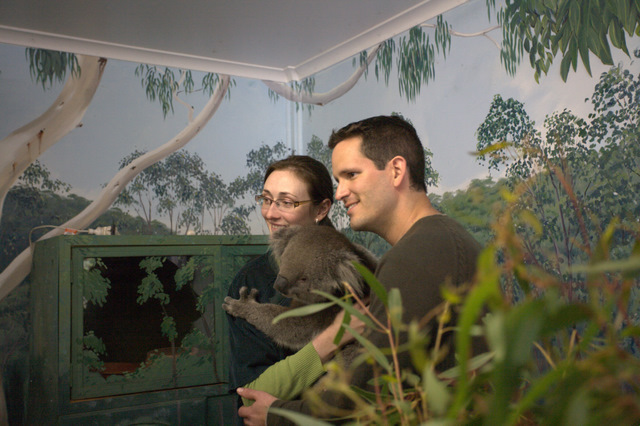 The soon-to-be-newlyweds, Kate and Abe, get to commune with Peter. Kate's sister Emily looks quite pleased, as well. 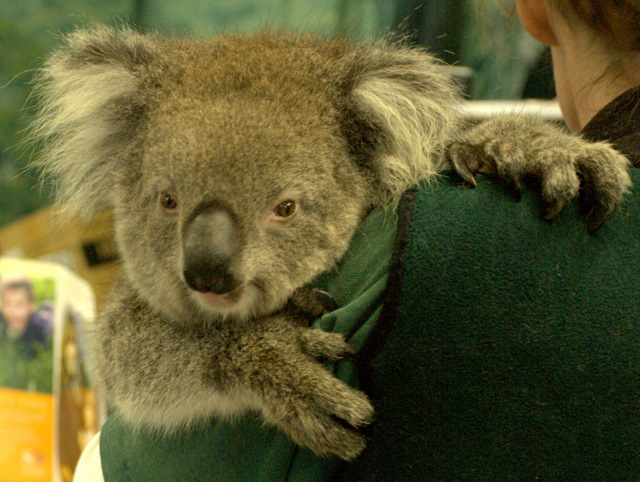 Holding a Koala definitely makes your day. You should get a prescription.